This is a stunning piece for the kitchen, an authentic reclaimed wine barrel wood serving tray with rustic iron handles. 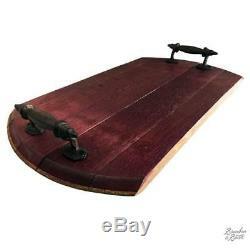 It is a rare find handmade from reclaimed Cabernet Wine Barrel heads from Sonoma California. Once their life is finished absorbing and transforming the red grapes into a delicious full body cabernet wine, the barrels are reclaimed from the winery and disassembled with the Wine Barrel heads removed. The top of the Wine Barrel Serving tray clearly shows the red stain from years of the grapes working their way into the wood fiber while aging the cabernet into a finished product. The top and back has been clear sealed wood a food grade sealant so the wood fiber will not chip or deteriorate. Each Wine Barrel top is cut to size, sanded, stained, and sealed for longevity. The handles on this serving tray are rustic iron from the period and attached with countersunk screws to the head. The Wine Barrel tops vary slightly on each tray. This piece is truly a rare, vintage piece that is both a conversation piece as well as a functional item, perfect for any serving tray purpose. 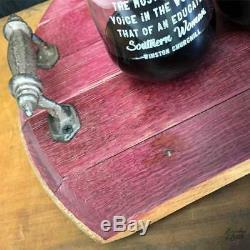 Reclaimed Wine Barrel Wood Serving Tray. Barrel is Reclaimed from Sonoma California Winery. Rustic Heavy Black Iron Reclaimed Handles. Size: 12W x 21.5L. 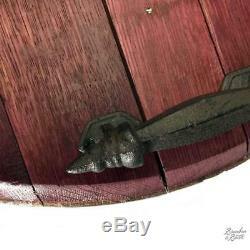 The item "Handmade Wine Barrel Wood Serving Tray With Rustic Iron Handles" is in sale since Friday, April 6, 2018. This item is in the category "Home & Garden\Kitchen, Dining & Bar\Dinnerware & Serving Dishes\Trays". The seller is "bourbonandboots" and is located in North Little Rock, Arkansas. This item can be shipped to United States, Canada, United Kingdom, Denmark, Romania, Slovakia, Bulgaria, Czech republic, Finland, Hungary, Latvia, Lithuania, Malta, Estonia, Australia, Greece, Portugal, Cyprus, Slovenia, Japan, China, Sweden, South Korea, Indonesia, Taiwan, South africa, Belgium, France, Hong Kong, Ireland, Netherlands, Poland, Spain, Italy, Germany, Austria, Israel, Mexico, New Zealand, Philippines, Singapore, Switzerland, Norway, Saudi arabia, Ukraine, United arab emirates, Qatar, Kuwait, Bahrain, Croatia, Malaysia, Brazil, Chile, Colombia, Costa rica, Dominican republic, Panama, Trinidad and tobago, Guatemala, El salvador, Honduras, Jamaica.